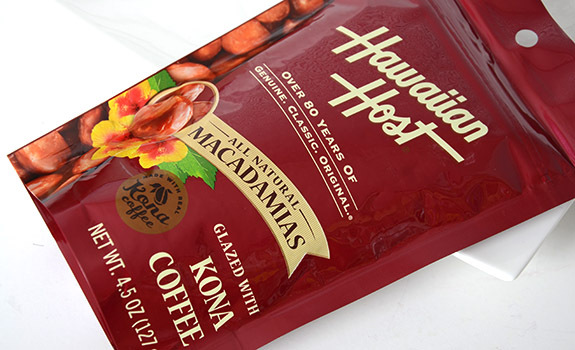 A bag of Hawaiian Host Macadamias Glazed with Kona Coffee. In the deepest days of an Alberta winter, I allow myself to fantasize about sunny places with beautiful beaches, Starbucks patios sheltered by the shade of palm trees, and easy access to the Sunday New York Times. I know some find it corny, but I adore Hawaii. It ticks all my boxes in terms of a perfect vacation destination. It’s easy, it’s familiar, and it’s also just different enough to provide a change of pace. But as much as I love Hawaii, it’s just not practical to make frequent trips. In the long stretches between visits to the Rainbow State, I have Hawaii 5-0, guava juice and imported Hawaiian Host products to tide me over. While I’ve sampled their chocolate-covered macadamia nuts in the past, I’d never seen these coffee-glazed macadamias in Calgary before spotting them with the other Hawaiian imports at London Drugs. So of course I bought them. The Pitch: “Made with real Kona coffee.” Of course, that Kona coffee is in fifth place in the ingredient listing, and it’s actually an “instant Kona coffee blend,” which means that, as is typical of so many Hawaiian coffees sold to tourists, the amount of Kona coffee in the blend may be so small as to be undetectable to even highly trained palates. This “Kona” coffee flavour is then dulled further by being turned into instant coffee. But hey, it’s the romance of the place, right? The Look: Pretty and practical. Zip-top pouch for easy access to a few nuts at a time. The nuts of various shapes and sizes are generously coated in a dark, hard, sugary coating. The Taste: The distinctive macadamia flavour – somewhat bland yet a perfect match to all sorts of other ingredients – with a sweetly bitter, buttery caramel bite. The coffee is very apparent, and the crunch is satisfying. A few nuts go a long way, and the bitterness builds if you have too many. The unfortunate “burned” notes of the caramel start to show through the more you eat. 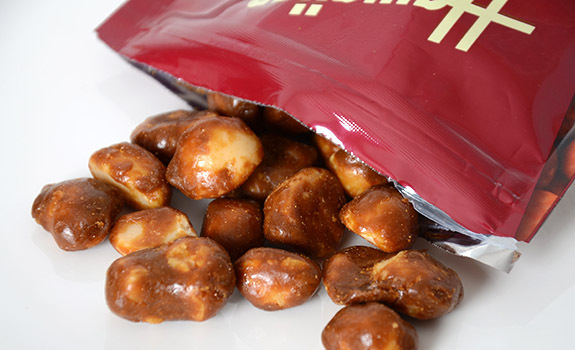 The coffee glaze on these macadamia nuts makes them crunchy and sweet, with some unfortunate burnt notes. Cost: $6.69 for a 4.5 oz (127 g) bag at London Drugs. Value for cash money: Meh. Macadamia nuts are expensive, so it’s not out of line. Nutrition? : Per 1/4 cup (30 grams): 190 calories, 16 grams of fat, 50 mg of sodium, 1 gram of fibre, 2 grams of protein. The verdict: Not bad, but I prefer the Kona-coffee glazed nuts from the Mauna Loa brand. And yet, for a taste of Hawaii in the Canadian winter, they’ll do – in moderation.